“Riding in a commercial jetliner simply isn’t traveling, as far as I’m concerned. It’s teleporting from point A to point B. You spend the entire time in the air just waiting to land, and afterward you speak of the flight only if it’s to complain about the turbulence or the snoring of the dude who sat next to you. The trip itself is nothing. A blank. A means of skipping ahead instead of wading through. Andrew McKinlay was less than 6 months old when he boarded his first international flight. He went to Europe when he was twelve, and by the time he was 16, he was backpacking on his own in Europe. There were a few years when Andrew didn’t travel very much as he was fully occupied establishing his software company, Axon Development Corporation. 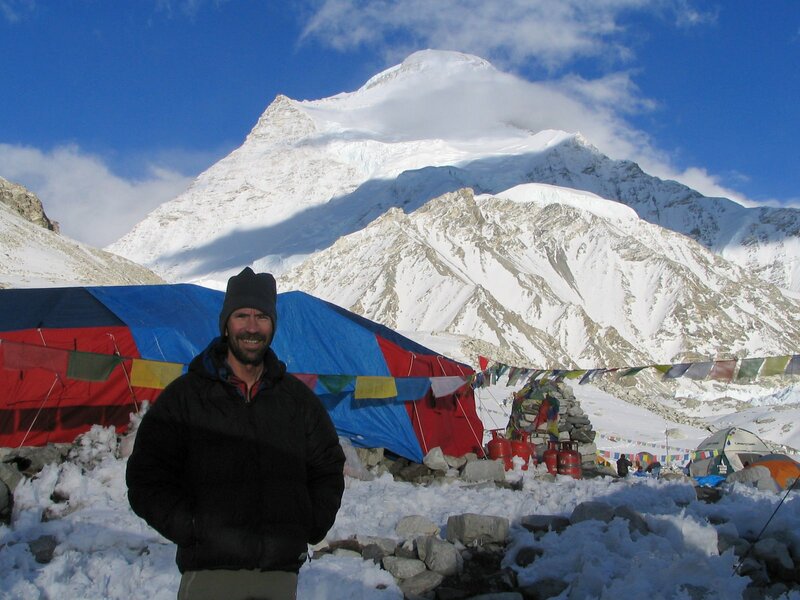 But he and his wife, Shelley, were soon boarding airplanes bound for the far corners of the earth as they climbed and led climbing expeditions on four different continents – from Mt. McKinley in Alaska to Kilimanjaro in Africa, and from Aconcagua in South America to Himalayan peaks in Nepal, China, and Pakistan. Climbing expeditions meant weeks and weeks away from civilization, discovering the beauty of remote mountain valleys, watching in awe as eagles soared overhead, and sharing the slopes with pikas and mountain sheep. Andrew became more and more aware of the earth’s fragility. The slopes of Everest were strewn with litter. Roads eroded the mountain valleys. There was a Holiday Inn in Kathmandu. He began to read extensively and slowly found ways to lighten his footprint. He and Shelley were avid cyclists, but they purchased a hybrid car for their trips to the mountains. They gradually adopted a vegetarian diet – how can you eat fish after scuba diving among the coral reefs? They are currently installing solar panels on their home. “I got frustrated listening to people who talk “green” but are unwilling to give up any part of their comfortable lifestyle,” Andrew says, “so I started thinking about what I could give up.” Airplanes generate huge amounts of greenhouse gas emissions that are particularly hard on the environment because they are emitted at high altitude. Takeoffs and landings use huge amounts of fuel. Although Andrew loved travelling, he decided to stop flying, a decision that would have a big impact on his leisure activities, especially as he and Shelley had just taken up scuba diving, an activity that is much more enjoyable in the tropics than it is in Canada. It has been almost two years since Andrew took an airplane, but he is still travelling – in fact, he took three trips in one summer to the west coast and down to Baja, Mexico. There are some challenges, and it does require extra planning, but there are also tremendous benefits. “Bus and train travel in Canada don’t have a good reputation,” says Andrew, “but it’s not like that in other countries. The buses in Peru have wi fi, movies, and first class seating.” Lots of people, including business people, travel by train in the dense population corridors on the east and west coasts of North America. It’s not as easy in Canada where a sparse population spread out across a huge country has not made train travel popular. 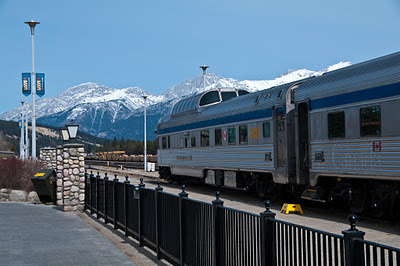 Canadian train journeys resemble a cruise with retired people willing to pay high fares to travel through the Rockies on an infrequent schedule. Once you abandon flying, travel becomes a leisurely part of the holiday. The dining car on the train offers three course meals, eaten while enjoying the scenery and chatting with fellow travellers. Andrew tries to avoid spending more than one night on a bus or train. Instead, he plans stopovers in small communities along the way. The train station is often downtown, so he can walk to his hotel and spend time exploring a new location. It does require more organization. Trains and buses link pairs of cities, so you must carefully plan your trip to join up far-flung destinations. You can only cross from Canada into the United States by train from Vancouver, Montreal or Toronto. Unfortunately, the predominance of air travel has eliminated some of the alternate options. Andrew and Shelley deliberately planned a scuba diving holiday in Bahamas as Andrew's research indicated he could travel by boat from the mainland to Bahamas and the other islands. But all of the ferry companies that used to operate have gone out of business. Public transport by boat is no longer an option, and Andrew has been forced to schedule a short flight from Fort Lauderdale to Nassau (while still travelling by train the rest of the way from Saskatoon). 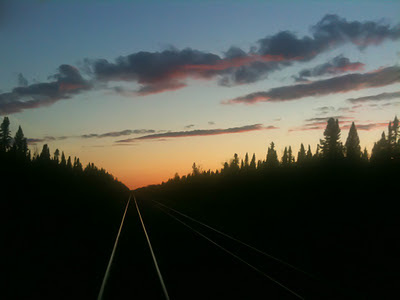 Addendum: Take a look at Jan Norris’ blog, A Car-Free Year, as she chronicles living one year car- and airplane-free.